The domesticity of ‘weaving nests’ as a cumulative, traditionally feminine form of meaning-making and inheritance, is paired with the tangible and more fleeting materials of ‘smoke and stone.’ Historically, weaving has been associated with images of women at the loom, creating creative and more pragmatic artefacts alike. To engage with ‘weaving’ is to work within this system of purposeful creation. The collection is a marrying of natural settings and creatures with human moments and activities. Similarly, the poems alternate between entrenchment in the material and the metaphysical. Mercer’s speakers are attentive and sympathetic, engaging with issues of love and loss, as well as celebrating the natural world. It is impossible to discuss this text without mentioning the birds. Numerous species of birds make up the focal draw of this text. Mercer’s engagements are as varied as they are frequent: birds range from being totemic, symbolic, purely ornamental, and personas in their own right. Native Australian birds set the boundaries for human interactions with the environment, but also with one another. As the collection progresses, birds become more human and vice versa. Early in the collection, there are gentle linkages specifically between women and birds: a small girl’s reverence for eastern rosellas; a family’s breakfast interrupted by sudden bird arrivals; Emily Dickinson in the mouth of a musk lorikeet; and the musings of Jenny, stricken with cancer, about the absence of birds during her trip to Italy. The delicacy of these voices and their particular connection with birdlife renders the critical tones of the collection more concrete, especially as the links become less subtle in ‘Spoonbill and swan’ and increasingly more personal in ‘The effects of immersion.’ The vulnerability of life, especially of female figures throughout the text, is strongly alluded to in these transient bird images. there is the company of birds. There is solace to be found, but also constant, soft reminders of loss and grief. Mercer’s exploration is as self-conscious as it is selfless, thoughtful and yet stylistically simple, approachable, and direct. fur sticking to all the city’s crevices. as we toil the glaring pavements. Cool change sweeps up the river. revels in the anarchy of wind. Monday morning, the park is active. middle-agers circumnavigate in comfort-plump shoes. the cool velvet of grass. my hungry arms angle round my ribs. Ambling aimless – I am the park’s only epicure. an arrow of magpie geese creaks off to work. home from hunting the night. no one enters the park’s centre. Structurally and tonally the speaker is removed from other human presences, linked more firmly with the birds and plants managing to thrive in this inner-city space. Here, birds are totemic, but also humanised – indeed, far more than the ‘human’ figures that appear in the first stanza. While the birds are still clearly linked with human experiences, the close attention to detail they receive clearly articulates Mercer’s ecocritical sympathies, as well as her rich understandings of human relationships and emotions. This is a space that deserves greater appreciation, and these are figures are require closer attention. Mercer treads a careful line between respect and conscription, and is successful in presenting a piece that is equal parts criticism and celebration. 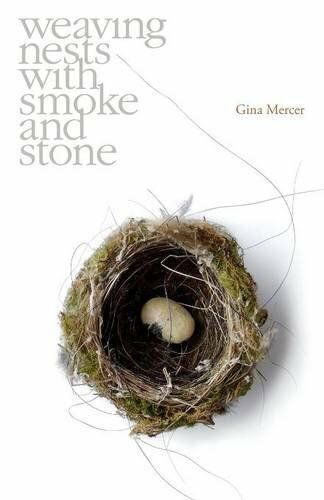 A delicate investigation of what is not essentially human, weaving nests with smoke and stone is a neatly lyrical collection that carefully explores love and loss, with an eye to the natural world for support, but also level-headed awareness of human responsibility. This entry was posted in BOOK REVIEWS and tagged Gina Mercer, Siobhan Hodge. Bookmark the permalink.